My husband and I spent a few precious days at our home away from home in the mountains this past weekend. Life grows stiller there for us, and we come back home rejuvenated for the tasks that lie ahead. 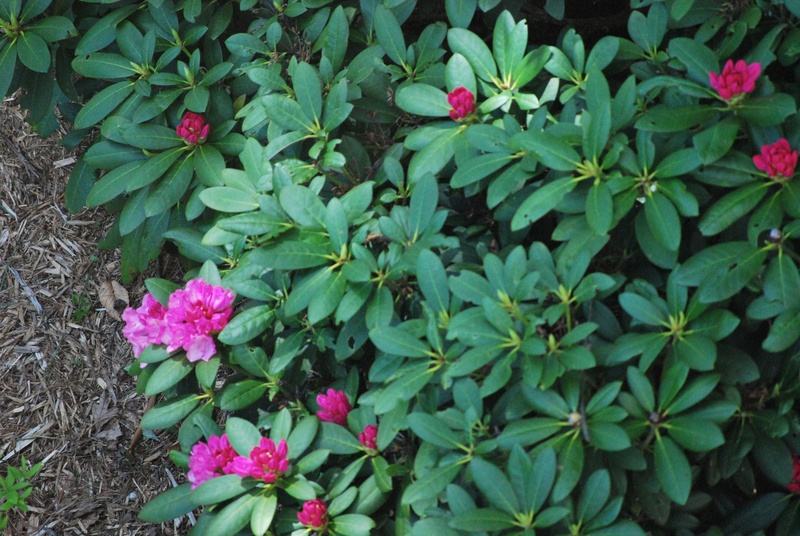 A few weeks back, one hummingbird buzzed by the house, hoping for the feeder of sugar water because the cold, wet spring had made the flowers shy to bloom. 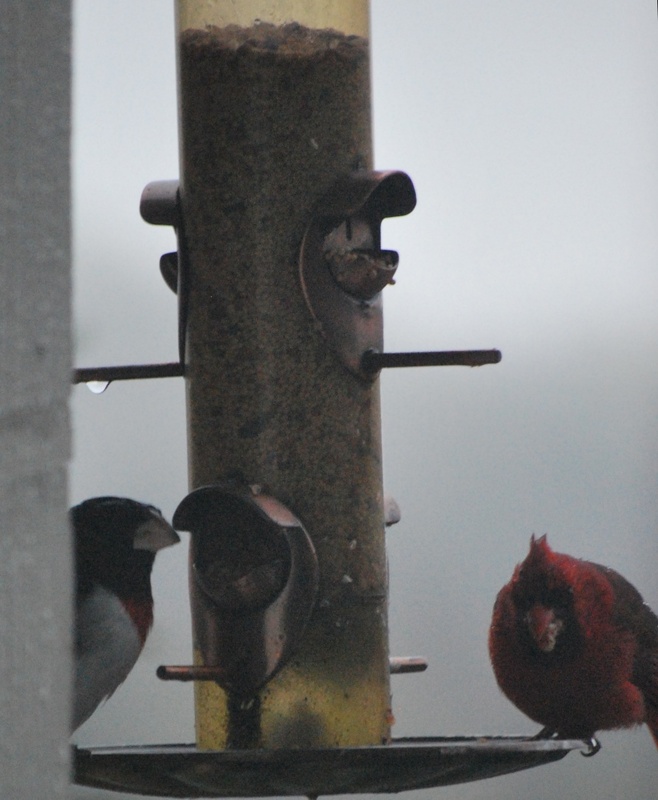 It had been a miserably wet weekend, and though I hadn’t yet put out the hummingbird feeder, thinking it too early for them to have come back for the season, we had put seed out for other birds. And they came in droves to show off their finery and eat their fill. 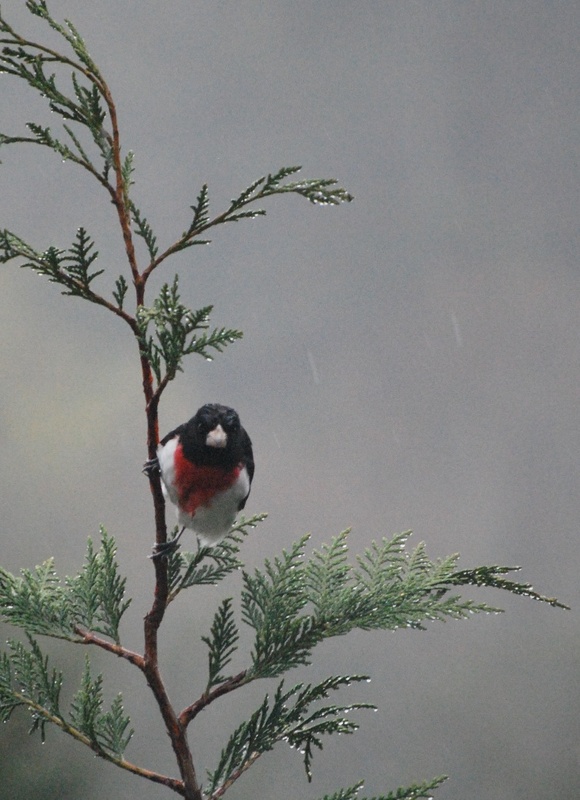 A male rose-breasted grosbeak enjoys a meal in the pouring rain. Will you feed me this time? The flowers had begun blooming, and shades of pink in the garden must have encouraged this tiny hummingbird to visit, but to see him resting so still on a tree branch, almost looking at me asking for the feeder this time – well, I went right inside and mixed up a batch of sugar water to fill the feeder. Finally! 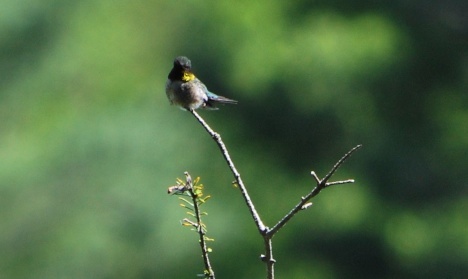 A hummingbird rewards me with a familiar buzzing that seems to vibrate the air all around. 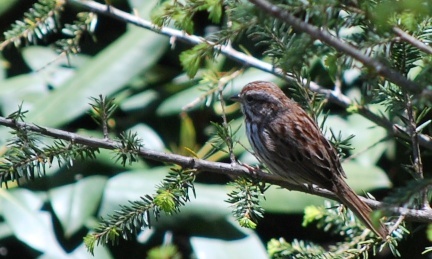 This beautiful singer distracted me from the hummingbird for a bit as it hid — and sang — lower down in the trees. 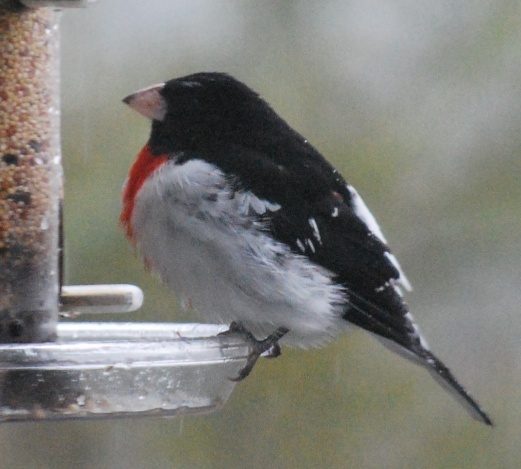 This entry was posted in flourishing tree and tagged bird feeders, birds, calm, hummingbird, Matthew 6:26, peace, photography, ruby-throated grosbeak, song birds, stillness by hopesquires. Bookmark the permalink. I, too, am enjoying watching for what kind of birds come to the bird feeder. Mostly, cardinals, male and female, blue Jays, Mockingbirds, (I think). I have learned some of the chirps or calls. It’s fun to run out on the patio when I hear a certain chirp, and think I know what kind of bird it is. 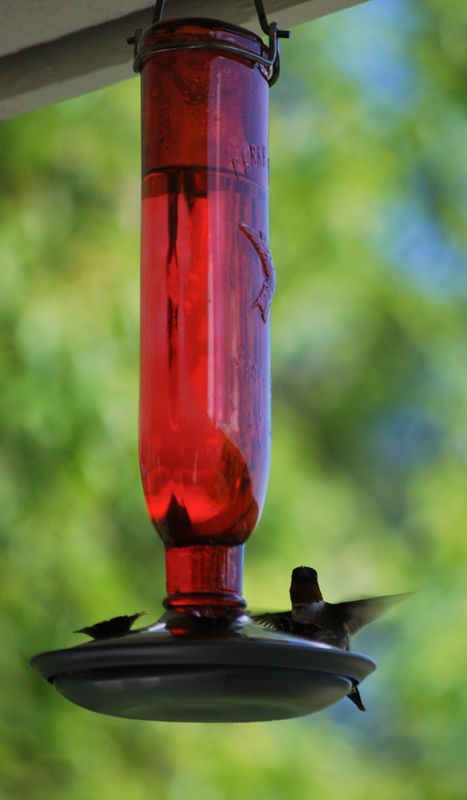 Have not tried to feed Hummingbirds, but we have them. I know. 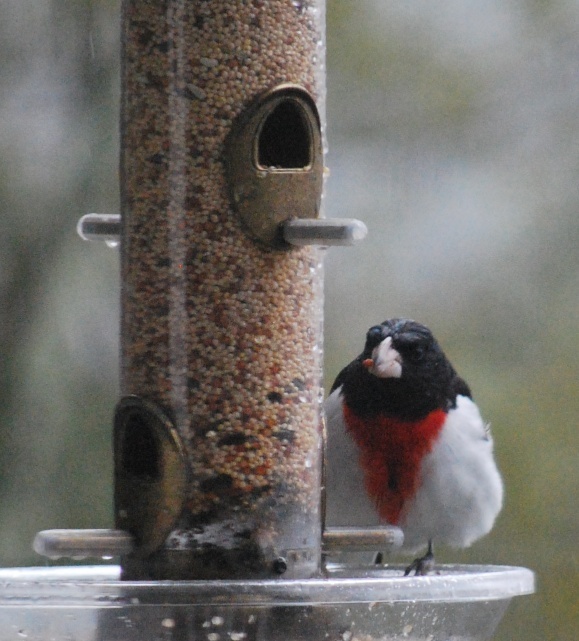 I’m glad you’re enjoying your feeder, too. It’s always fun (and sometimes challenging) to try to figure out what kind of birds are visiting. WOW! 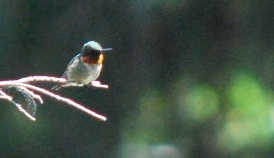 I don’t think I have ever seen a hummingbird sit still! GREAT PHOTO!! The woodpeckers around my yard have been exceptionally busy (and loud) this spring…wonder if that means something? Thanks, Jackie! 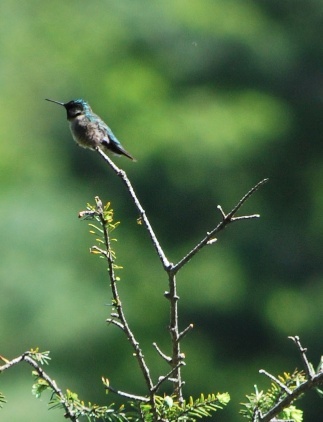 I loved seeing the hummingbird sit so still, because it’s not something I usually see. So I was thrilled to capture it with my camera. I have no idea if over-active woodpeckers signal anything, but maybe it has been an idea spring for the kinds of critters they like to eat.